Personal training is a great way to improve your health and fitness while also increasing your knowledge base. The one on one time spent with your trainer is valuable. It gives opportunity to both the trainee and trainer to improve and assess progression. Personal training on it’s own is not without limitations. Time and money. Two major players in decision making, particularly when speaking of fitness activities. Let’s tackle time first. Committing to a personal training session means you want to be there. What if you have to stay back for work? Maybe you had to pick up the kids unexpectedly? Now you can’t make the scheduled session and your trainer is booked out for the rest of the week. You only have x amount of time and so does your trainer to see all their other clients. What if you could see a trainer every time you exercised? What if you had the choice of seven times a day where you could receive attention by a professional coach? We will answer these, but first, let’s talk money. Personal training is not cheap, nor should it be. A good personal trainer will spend hours prior to your session to fine tune what is best for you and how to move forward. They are your guide towards your goal and because of this frequency of sessions is very important. Their goal is to learn about you, discover how you move, what it is you adapt to best, what you struggle with and how you recover. The price tag that comes with good personal training stops most people from getting started. Why? One session per week is at least fives times more expensive that a regular gym membership. Keep in mind that regular gym membership DOES NOT include individualised sessions with a good personal trainer, it only gives you access to equipment. So you have a hard choice to make, do one valuable session per week with a great personal trainer OR join a regular gym and hope what you are doing will bring your goals closer. We have formulated a way to ensure you get the most out of a gym membership and also receive individual attention. Every single one of our classes is an opportunity in which you can be trained by a coach. You also have a program pre written for you and your fellow class members. Remember the choice of seven times a day where you could receive attention by a professional coach? These are our classes. 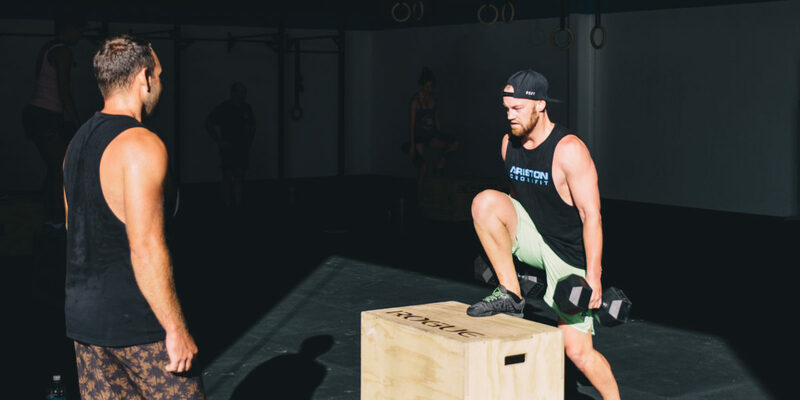 Small group environments where your coach runs you through a specific warm up, outlines the goals of the workout, the movements and how to scale or modify then wrapping up with a cool down and stretching. The goals of the workout may be different for you and the movements can be scaled to your needs too. These are not classes where you are left on your own. You are coached through the session along with everyone else in the class. Now to how we personalize your gym membership. When you join Ariston you are assigned a primary coach. This coach is with you for the lifetime of your membership, regularly checking in to see how you are going. We also offer one on one sessions, more commonly known as personal training. Members use these sessions on top of their classes to accelerate their progression towards their own individual goals. They can use the knowledge gained from these sessions to do extra work in open gym times but best of all, they take this into their class workouts. Allowing their coach and them to create a individualised stimulus from the workout that will best serve them and their goals. This all adds up to 34 personalised classes per week, a coach assigned to you, one on one sessions (1-4 times per month) AND the chance to train with other motivating like minded people. All of this value for the same price as one personal training session, that sounds like the new way to do personal training to me!